The transition from non-invasive phenotype to invasive phenotype of tumor cells marks the switch from a benign tumor to a more malignant form of cancer. Understanding the mechanisms underlying this hallmark event, which enables tumor cells to invade through Extracellular matrix, is critical for discovering pathways and new targets to develop anti-metastatic strategies. The discovery of anti-metastatic agents that inhibit cancer cell motility has been hindered by a dearth of cell motility assays that are compatible with high–throughput screening. Previously, we developed an assay for the study of cell migration in 96-well plates. A self-dissolving biocompatible gel (BCG) is utilized to form central, uniformly sized, cell-free detection zones in each well of a collagen I coated 96-well plate. Cells seeded into these wells pattern in an annular monolayer surrounding the BCG. Once the BCG dissolves, an overlay of collagen I is applied to each well, following which cells can invade in 3 dimensions into the detection zone previously occupied by the BCG . The Oris™ Pro 96-well Invasion Assay presents a straightforward, accessible and quantifiable method to study adherent cell invasion, and can be used for example to evaluate candidate drugs targeting tumor invasion. Microscopic visual assessment of cell invasion is feasible throughout the course of the experiment. In this study we demonstrate the use of this Oris™ Pro 96-well invasion assay for robust and reproducible analysis of HT-1080 cell invasion in 3 dimensions. We discuss optimization of assay factors that influence cell invasion, including concentration of collagen, time- kinetics and use of cell motility inhibitors, as well as methods for qualitative and quantitative analysis of cell invasion. We conclude that the Oris™ Pro 96-well invasion assay can be used for high throughput and high content screening of compounds that influence cell invasion. 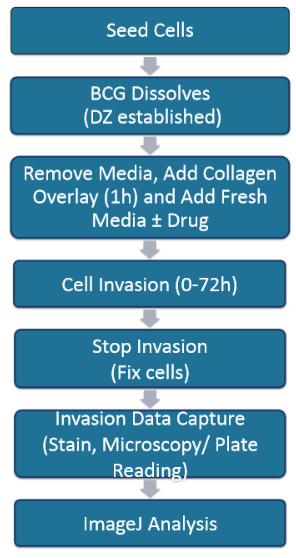 Figure 2: Workflow for Invasion Assays. HT-1080 cells were seeded at optimal density (30,000 cells/well) and allowed to adhere before removal of media. 40 μL Rat Tail Collagen Type I was overlaid at 2-3 mg/mL. Fresh media ±drug is added and cell invasion was assayed at multiple intervals by fixing cells with 0.25% gluteraldehyde, staining with DAPI, and imaging using a Zeiss Observer fluorescence microscope. Figure 3: Image analysis using ImageJ to generate orthogonal view images. Z-stack images of cells were analyzed using ImageJ (NIH) software. Representative images taken at (A) 2.5 x and (B) 5 x magnification. Stacks of images were taken at optimal Nyquist rates (A) 21.39 μm and (B) 12.03 μm. Images were processed to obtain orthogonal views of the XZ plane (bottom panel) and YZ plane (right panel) The Z-lines were set at the zero plane for each well. Total height of Z-stacks are (A) 1519 μm and (B) 1516 μm. The orange dashed lines superimposed onto all images, indicate the boundaries of the starting cell-free detection zones. Figure 4: Increasing the concentration of the collagen overlay restricts invasion as a function of time in the cell invasion assay. Cell invasion assay was performed by varying matrix overlay with 2 or 3 mg/mL collagen and assayed at 0, 24, 48, and 72 h. The results demonstrate an increase in cell invasion as a function of time and lower levels of invasion in the higher concentration collagen matrices. (A) Orthogonal views demonstrate cell movement into the DZ (orange lines). At 48 h and 72 h (not shown), significant invasion into the Z-plane and DZ was observed with 3 mg/mL allowing the least amount of cellular movement. (B) Quantification of invasion corroborates visual observation – increase in invasion over time and decrease with higher concentration of collagen matrices, at different Z heights (0, 100 , 170 μm). Figure 5 : Inhibition of 2-D migration and 3-D invasion with Cytochalasin D: Cell migration and invasion were assayed at 21 and 45 h respectively, with a 2 mg/mL Collagen I overlay for invasion plates alone. The plates were imaged using fluorescence microscopy : (A) 2-D migration in control (0.1 % DMSO) and at 0.06-2 μM concentration of Cytochalasin D (B) Orthogonal view of images using Image J of 3-D invasion plates demonstrating invasion in control and inhibitor treated plates. Representative images taken at 2.5 x magnification and are 877 μm in Z-height. (C) Results demonstrate inhibition of both 2-D and 3-D motility by Cytochalasin D. However dose required is higher for invasion (purple line) as indicated by higher IC50 value (0.5606 μM) compared to migration (blue line) (0.1182 μM). Assay conditions for the Oris™ Pro 96-well Cell Invasion Assay can be optimized with any cell line by varying a few parameters such as collagen concentration & time-point. Images of invading cells in the Z-plane can be captured by fluorescence microscopy and analyzed using ImageJ (NIH). Orthogonal view images demonstrate the extent of cell invasion into the Z-plane. The degree of 3-D invasion is dependent on concentration of collagen in the overlay and is time dependent. 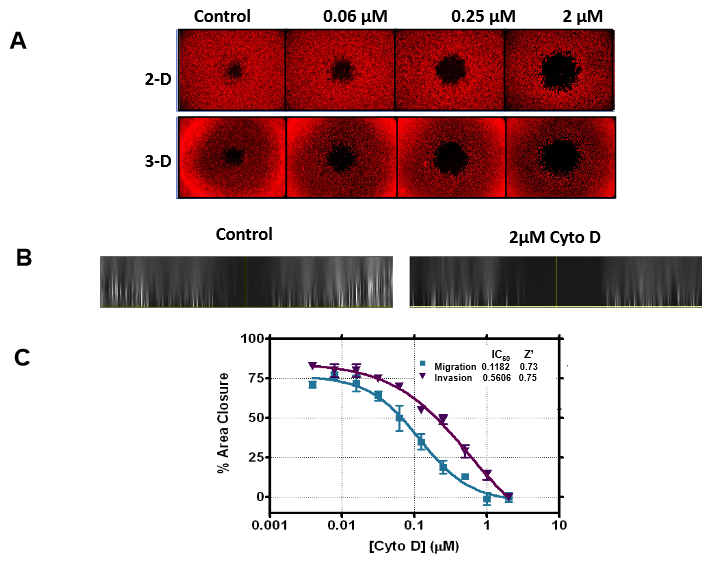 HT-1080 cell motility is inhibited using Cytochalasin D. The IC50 values are different for 2-D migration versus 3-D invasion. 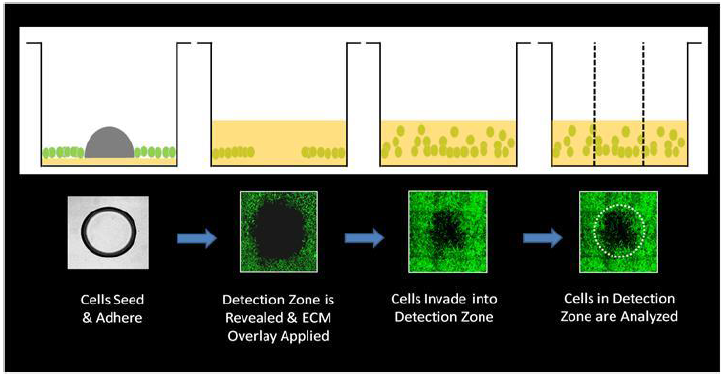 The Oris™ Pro Cell Invasion Assay is versatile, allowing convenient 3-D cell invasion analysis with unrestricted access, measurement of cellular invasion in the Z-plane, and potential compatibility with automation and HCS. This work was partially supported by grant 2R44GM090386-02 from the National Institute of General Medical Sciences (NIH).